A compelling and slick graphic adaptation of Night Rise - the third book in this epic, supernatural and action-packed series by bestselling author Anthony Horowitz. 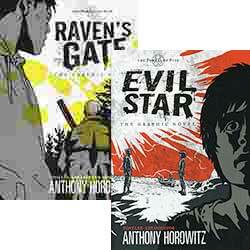 A stylish re-issue of the atmospheric graphic-novel adaptation of the Number 1 bestseller Raven's Gate, from the creator of Alex Rider. Matt has always known he has unusual powers. Raised in foster care, he is sent to Yorkshire on a rehabilitation programme, only to find himself in the midst of sinister goings-on. The battle with the Old Ones continues in the third exciting volume of the bestselling Power of Five series, from the creator of Alex Rider. He always knew he was different. First there were the dreams. Then the deaths began. When Matt Freeman gets into trouble with the police, he's sent to be fostered in Yorkshire. 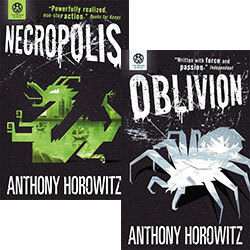 The thrilling fourth book in the supernatural series from bestselling Anthony Horowitz.